Chicago Cubs pitcher Jon Lester can’t throw the ball to first base in what is thought to be a strange case of the yips. On Sunday, Lester showed a new method he’s working on – bouncing the ball to first like a bounce pass in basketball. The first attempt did not go well. Chicago Cubs pitcher Jon Lester has struggled for years with throwing the ball to first base in what appears to be one of the strangest cases of the yips the sports world has ever seen. 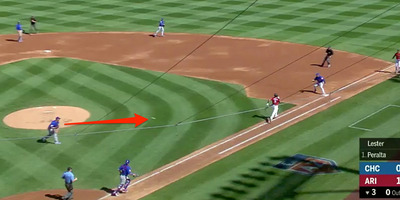 Lester has tried to manage the problem before, famously throwing the ball in his glove to first base to record an out. Now, in spring training, Lester is trying a new method: bouncing the ball to first base. It didn’t go so well Sunday. During an exhibition game against the Arizona Diamondbacks, Lester knocked down a grounder up the middle and fielded it. Instead of making a routine throw to first or even underhanding it, Lester chucked the ball at the ground like a bounce pass in basketball. The ball went under the first baseman Efren Navarro’s glove and got away, however, allowing the Diamondbacks to take second base on the error. After the game, Lester bemoaned throwing it to Navarro, a minor leaguer who was not expecting the unusual delivery. While Lester said the new method was meant to ease the defensive burden on third baseman Kris Bryant and catcher Willson Contreras, it’s worth wondering whether Lester’s new methods will work. On Sunday, even if the bounce pass were fielded cleanly, it arrived several beats behind the runner. Spring training is a time to work out new skills, so perhaps Lester will master this new technique. If not, the Cubs will still be left with a great pitcher with a career 3.51 ERA who strangely cannot make one of the most basic plays in the game.